But for those of you who have kids, or grandkids, or you yourself like teen books (like me! ), each month I’ll introduce some of my favorite Christian and Catholic YA books. March is always a time of spiritual reflection as we journey through Lent. 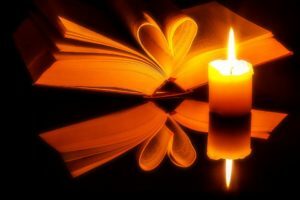 So, it seems like an appropriate time to highlight some books about spiritual gifts. I truly believe we all have gifts from God, unique talents that our creator has blessed us with. In fact, this is a topic that I include in all my books. But this month’s featured novels explore the possibility of God using people in very extraordinary ways. These fictional books, which include a mystery, a contemporary romance, and a dystopian adventure, are about teens that have been given unique gifts that they must figure out how to use. 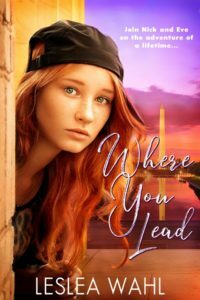 Where You Lead is my newest novel that was released in September. The story begins with Eve, an average teenager living in New Mexico. Her life is far from exciting, but when she has an odd vision of a teen boy named Nick, everything changes. Although she has never met this boy and has no idea where he lives, Eve feels God is calling her to find him. This search leads to a grand adventure set in Washington DC. Nick and Eve, who both have the courage to say yes to God’s calling, find themselves entangled in a mystery involving international trade agreements, foreign political affairs, and missing Confederate Gold. The opening scene of this book is based on a thought that flashed into my mind over 25 years ago when my husband and I were newly married and had just moved to Washington DC. I always thought it would make a great beginning to a book. Years later, after I began my writing career, I thought back on this idea and tried to figure out how I could make it work in a YA novel. Finally, inspiration struck, and that little idea grew into my latest adventurous mystery. This Christian YA novel is the story of Shilo Gianelli who has been granted an unusual gift from God – the ability to heal. Shilo is a high school soccer player with a cute boyfriend, an annoying sister, and a best friend who seems too busy for her. But an unusual encounter with a teen mom and her injured son suddenly sends Shilo’s life spiraling out of control. This is the first novel I’ve read by Miura and thoroughly enjoyed her writing – especially the voice of Shilo. Miura captured the sass and sarcasm of a teen girl perfectly. While some of Shilo’s actions were frustrating, they totally made sense for a teen girl’s emotional mind. I really thought this was a fascinating idea and concept. I loved the fact that Shilo must learn that this power is a gift from God. She is the vessel for His healing power and cannot pick and choose whom to heal. I appreciated the message that God has a divine plan, and we don’t always know the reason that some prayers are answered and others are not. 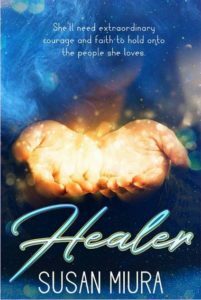 The Healer is an enjoyable book with wonderful characters, exciting scenes, and a thought-provoking message. Looking for a hard-to-put-down Dystopian novel? The Gifting might be the book for you. This Christian novel is the first book in a series and, be forewarned – it will be hard to stop reading after the first book. 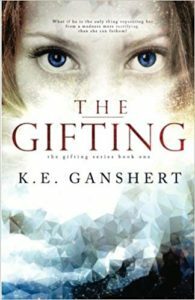 This novel grabbed my attention, and the idea of a prophetic gift was intriguing. This YA novel, while very modern day-ish, is set in a future where religion is all but banned. Science is the answer and has proven faith to be false and irrelevant. To ensure only healthy babies are born, this “advanced” society tests all pregnant women for any imperfections in order to cleanse people of any abnormalities. When teenager Tess begins seeing things that others do not, the only reasonable conclusion is that she has some sort of psychosis – which would be extremely dangerous and life-threatening to admit. Dystopian stories are always interesting and make you think about where we are headed as a society and how our actions today could alter things in the future. While this book’s futuristic concepts are fascinating and terrifying – the author also brings up some serious issues that teens today can relate to – cliques, bullying, drugs and even the dangers of exploring the occult. Great book for older teens. I haven’t read Healer yet, but I can vouch for your book and the Gifting series, which I’d love to re-read!